What's the Price for the 2018 Volkswagen Atlas? How Many MPG Does the 2018 Volkswagen Atlas Get? What's New for the 2018 Volkswagen Atlas? The Volkswagen Atlas hit the market hard in 2018. It took its place right alongside some of the other favorites in the midsize class. The Tiguan, Golf Alltrack and SportWagen all have their own great features. The Atlas has its own unique look on the outside and some great interior features. It is also a very practical vehicle. If you need to commute to and from work each day in a vehicle that will be comfortable and keep you safe, then the 2018 Volkswagen Atlas is for you. It also works great as a family vehicle since there is plenty of interior seating and plenty of interior cargo space. Let’s take a closer look at the Atlas. The Volkswagen Atlas is new to the Volkswagen lineup this year. This is also the first three row vehicle that fits the crossover bill being offered in the U.S. by Volkswagen. There are some similar parts of the Atlas that you will find in other models. The MWB chassis is featured on the Atlas as are the available drivetrains. This doesn’t mean this is a vehicle that has been thrown together with some various and favorable parts. This Atlas is a really beautiful vehicle that serves its purpose in the vehicle market right now. The standard trim level for the 2018 Atlas comes with a 2.0-liter, turbocharged engine that is currently rated at about 235 horsepower with 258 pound feet of torque. There is also a 3.6-liter VR6 engine available that provides 276 horsepower and 266 pound feet of torque. Both of these engine options provide their power using an eight-speed automatic transmission. Front wheel drive is also standard with both engines. The 3.6-liter engine has the ability for a 4Motion, all-wheel drive system. The interior of the Atlas has 153.7 cubic feet of space. This is impressive for this class of vehicles. You also get the Volkswagen touchscreen infotainment system, Apple CarPlay, Android Auto and MirrorLink. You can upgrade your base level sound system to a Fender audio sound system if you want a better sound quality. A higher-end R-Line trim level provides even more great interior features like better material, upgraded gauge clusters and knobs, etc. The Atlas is one of this German automaker’s greatest creations. As a brand new, three row midsize crossover, the Atlas has generated a lot of interest from out clientele. It looks great on the road but it also packs a lot of punch when it comes to interior and power under the hood. It has already stood up to other similar vehicles like the Chevy Traverse, Nissan Pathfinder and Dodge Durango. Stop by our Volkswagen dealership to take a look at the Atlas for yourself and to give it a test drive. We are happy to answer any questions that you have regarding the Atlas or another vehicle on our lot. We also have plenty of information available for you when it comes to discussing different financing options. * Starting MSRP excludes destination, taxes, title, other options, and dealer charges. Dealer sets actual price. Specifications, equipment, options, and prices are subject to change without notice. 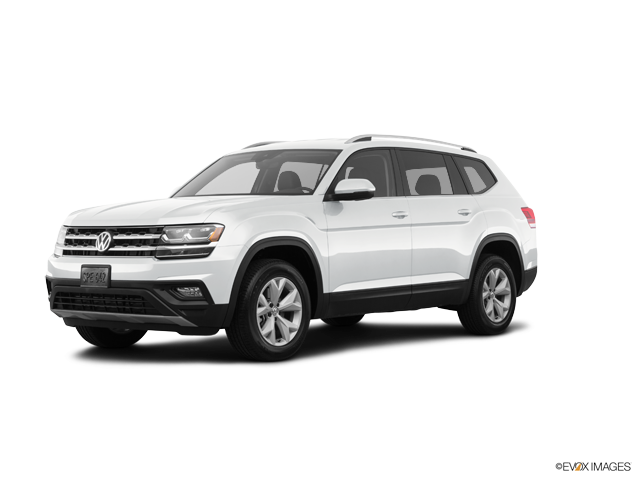 MSRP of $30,750 is for a 2018 Volkswagen Atlas S. Model shown is a 2018 Volkswagen Atlas SE, which has a starting MSRP of $35,240. ** Based on EPA estimates. See www.fueleconomy.gov for details. Your mileage will vary and depends on several factors, including your driving habits and vehicle condition.